There are several ways to grill vegetables, depending on the type of vegetables and the recipe. The problem is that many vegetables are either cut into small pieces which then can fall between the grates of your grill, or the vegetables are too soft or delicate and start to stick or fall apart when placed directly on a grill. There is nothing white as depressing as perfectly good food falling into your coals or fire! Never fear, there are solutions! The grill is not only reserved for cooking meats, far from it! Here are a few tips on different ways to cook vegetables on the grill. If vegetables are firm and large, either sliced or cooked whole, they can be cooked directly on the grill like a piece of meat. However, as they cook and get softer, then can fall apart and fall between the grill grates unless the pieces are very large. 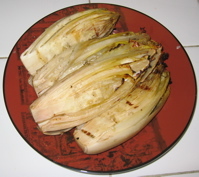 Examples of veggies that cook well this way are halved potatoes, halved grilled endive as pictured here, thick slices of onion, large portabello mushrooms, or whole sweet bell peppers. 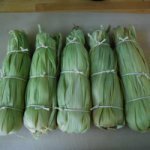 I have a couple excellent recipes for these such as my grilled endive recipe and roasted sweet pepper recipe. Some long vegetables, like larger asparagus spears, can be cooked directly on the grill as well, just be sure to lay them at a 90° angle to the bars of the grate and be careful they don't turn. If they turn, they can fall in between the grates! A vegetable basket or tray is a metal basket or tray which sits in your grill or barbecue and usually has holes or slits for heat and smoke to circulate. They help to hold smaller vegetable pieces while you grill vegetables so that they do not fall through the grates. If placed over high direct heat you can still get the nice rich caramelization and smokey flavors of grilled foods. You can also place it off to the side to cook more slowly in the ambient heat, particularly if you close the lid of the grill. This is great for chopped vegetables of any kind such as chopped onions, carrots, potatoes, etc. Corn is a unique vegetable in that it comes naturally with a nice tough husk to protect it. While you may have thought of the husk as just an annoying thing to pull off when preparing corn, it can be used to your advantage when grilling. After removing the inner silk, the intact husks can be tied back together so that you can cook the cork directly on the grill. It helps to soak the corn for a while first and also to season inside the husk before tying them up. 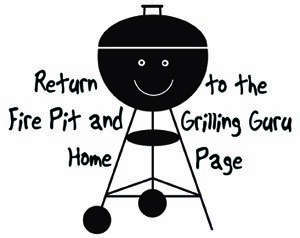 For more detailed instructions see the grilled corn recipe page. Most people don't think to use pots and pans on your grill or fire pit but there is no reason you can't do so. Even if you don't have a side burner you can throw a pot or skillet right on your grill. It helps to have an intense, high direct heat. It also helps to have a nice sturdy skillet that is all metal. A plastic or wood handle can melt or burn! 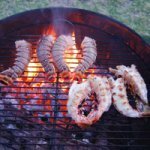 I love to use cast iron pots and skillets directly on my fire pit or grill for all sorts of interesting grilled recipes. You can grill vegetables this way just like you would stir-fry or saute on the stovetop. 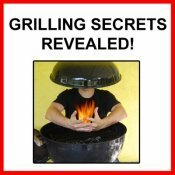 In addition, if you close the lid over it for a while, you can infuse your foods with grilled smoke flavors as well. Be sure to use a bit of oil or butter to prevent sticking! Done learning about How to Grill Vegetables?